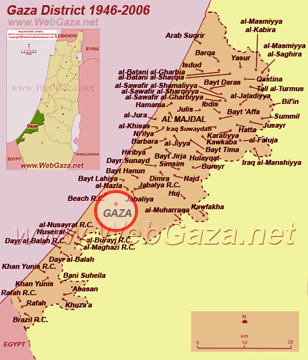 Gaza (Ghazzah) - Where is Gaza (Ghazzah) Located? One of the Villages/Cities of Gaza District, find here important information and profiles from Gaza (Ghazzah). Where is Gaza (Ghazzah) Located? Gaza is located in the south part of Gaza District, north of Khan Yunis, south of al-Majdal Asqalan, as shown on the map. Gaza City is the largest Palestinian City and the temporary administrative capital residence of the Palestinian National Authority. After years of occupation and denial of its historical identity, Gaza is now recollect-ing its flourishing past: archaeological research as well as ancient writings have proved that Gaza is one of the oldest cities in the world. Situated in a strategic location on the trade routes between Asia and Africa, between the desert in the South and the Mediterranean climate in the North, Gaza is a very fertile land that has always been an important destination for travelers by land and sea. As a crossroad city Gaza was also a wealthy trading place that has been coveted and regularly captured by successive waves of armies. However, symbols of the struggle of the Palestinians, the citizens of Gaza have shown their determination and vitality. After years of Israeli occupation, Gazans are now fighting in rebuilding their city. A lot has already been done and one can enjoy the beautiful seashore and wonderful hospitality of the Gazans.